Mrs. Hufnagel interrupts Jack's sleep, invades his privacy, and meets a doctor she actually likes. 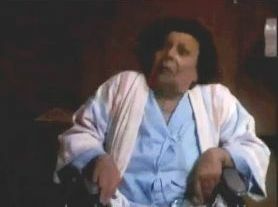 The scenes in "Whistle, Wyler Works" featuring St. Eligius's most difficult patient, Mrs. Hufnagel (Florence Halop), are two of my favorites (her encounter with Westphall is probably #1). In the first scene, it's because of her reaction to having someone call her out on her behavior; in the second, I love that we see what happens when she meets someone about whom she has observed no personal weaknesses to exploit. Dr. Jack Morrison (David Morse) is asleep in the on-call room when Mrs. Hufnagel wheels in to remind him that she wanted a consult with a plastic surgeon and to return his red knapsack, which he left in her room the day before. When she reveals that she read the letter his sister (probably; Jack doesn't confirm it), wrote him, Jack gets angry at her for violating his privacy. He berates her for only caring about herself, and her attempt to elicit his sympathy by "crying" proves ineffective. Later, plastic surgeon Dr. Bobby Caldwell (Mark Harmon) arrives to provide a consult. The only flaw she can seem to find is that he looks young. She wants the Phyllis Diller treatment, as her new boyfriend Murray is in show business, and she needs to compete with the babes for his attention. Caldwell tells her that if he were to take away her lines, she would lose the beauty that comes with wisdom and experience. He says she doesn't need to change a thing, and that Murray probably agrees with him. She's thoroughly charmed. Caldwell then runs into Ehrlich (Ed Begley, Jr.) and Fiscus (Howie Mandel) in the hallway and asks why everyone is so upset with Florence, who he found pleasant. They incorrectly presume she must be feeling better. Little did Mrs. Hufnagel know that Jack had plenty of practice dealing with awful patients. In "Bypass", the second episode of the series, he made a big speech to Westphall about how he didn't like having to treat awful patients like murderous terrorist bomber Andrew Rhinehardt (Tim Robbins). Seems like Jack has become more cynical since his first year of residency. "No wonder your girlfriend moved out. You look terrible when get up." Mrs. Hufnagel is apparently the hospital's busybody--Jack had recently attempted co-habitation with his girlfriend, Clancy (Helen Hunt). One of my favorite Hufnagel character traits is that she manages to discover all the major, defining events in other people's lives. How? We don't know. But she seems to know the hospital as well as anyone, except probably Luther. I think this is my favorite Bobby Caldwell scene, even more so than the dark stuff that comes the next season. I love that Mark Harmon's most charming moment is with Florence Halop. And because Mrs. Hufnagel is so vile to everyone else, it's hilarious. Mrs. Hufnagel is bored in the first scene because she can't watch Wink Martindale on her TV. At the time, he was the host of the game show Tic Tac Dough, which was one of my childhood favorites.